All wins are not created equal. When we say Kevin Love is worth $45 million and Kobe Bryant is “only” worth $20 million, we leave out the fact that wins are worth more in Los Angeles than Minnesota. This didn’t sit well with Arturo, our Director of Analytics. He decided to break down the difference in the value of a win for each market. It turns out that not all markets are created equal. For example here’s LeBron James’ value across markets. What’s the value of a win? Arturo did an estimate of each team’s net operating income. This is basically how much money the team brings in (from ticket sales, TV deals and main revenue streams) minus the cost of the players salaries. Using this number as a baseline Arturo estimated how much a win was in each market and there were some pretty big differences. The most interesting thing to me is that the large market teams are getting a huge discount. Even up against the hard cap, the Lakers are essentially paying half price for their wins. At the same time various small market teams (sorry New Orleans, Charlotte and Indiana) are in major trouble unless they are a contender every year. The big market teams have a major advantage against the small market teams. 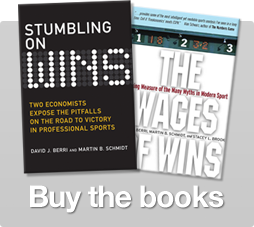 It’s not that they can buy more wins; in fact, the numbers show spending is a very poor predictor of winning. No, the major advantage that the big market teams have is that they can afford to lose. Small market teams don’t have the same luxury. If we ask who the salary cap helps it turns out it is the big market teams. The fact that any big market can only spend around $90 million means that as long as they produce pedestrian basketball (see New York) they’ll be fine. The “competitive balance” myth we keep hearing about and the “need for salary control” might just be rhetoric by big market teams that want to get an even bigger discount. This will come at the cost of the small market teams and the players, who may very well go along with it, believing that it’s for the best. 8 Responses to "The win exchange rate"
Hey guys, I wanted to ask if you meant to change the RSS feed on wagesofwins.com from how it was on wagesofwins.net. On this new site, the RSS feed is truncated and you have to click through to see the entire post. On the old site, you could read the entire article in the RSS reader. It would be nice if you could change it back. Done! Be aware some of our newer graphics may be at the mercy of your RSS reader as to if they’ll show up. This is the value of the *average* win, right? Not the *marginal* win.